scale, rust, oil and grease. Absorbent substrates must be saturated throughly, but no standing water. For J rote of 12 second, approx. 3.75 litres of water. (approx. 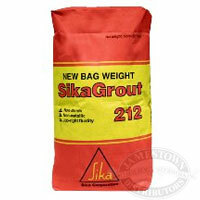 15% by weight of SikaGrout® 212-11) should be used. tor attached, until a smooth, even consistency is achieved. mortar with extended working time to suit local ambient temperatures. Coverage: Approx. 2 kg of powder for one litre of mortar.